All of the above deserve their own, substantive breakdowns, and this caper has already received plenty of coverage. A league-sponsored investigation is ongoing, in fact. There is no basketball-related reason to draw more attention to this, a game between two teams who hate each other and who, in all likelihood, could only combine to push the Warriors to six games if they were to make it to the conference finals. The game itself was as garden-variety as so-called “revenge games” go; the Clippers, a spurned lover, took out their frustrations on Chris Paul and the Rockets, bereft of their MVP candidate James Harden. What happened afterward, however, is the stuff of black-and-white supermarket tabloids, begging you to buy into their truthiness. On the ensuing play, Griffin backed Chris Paul down in the post and drew a foul, which Paul, no stranger to rage, immediately began arguing. While arguing with the ref, Paul took it upon himself to exchange some words with Griffin, aided by Trevor Ariza. Reports suggest Paul and Griffin did not have the greatest relationship as Clipper teammates, even in the halcyon days of Lob City. A brouhaha broke out, leading to the technical foul-prompted ejections of both Griffin and Ariza. All the while, injured Clippers guard (and son of Clippers coach, Doc Rivers, as well as former backup to Chris Paul) Austin Rivers was being especially chatty in his dissection of the game, dressed to the nines in his tailored suit and walking boot. Reports initially pointed toward an in-house fight among Rockets, including the still-injured Harden, which Paul referred to as, what else, “Donald Trump fake news.” Congratulations to the POTUS on having his own brand of reportage. I hope it comes barrel-aged. Afterward, it came out that Ariza led a band of Rockets, including Paul, Harden and Gerald Green, through a “secret passageway” to the Los Angeles locker room that Paul allegedly knew about because of his time with the Clippers. While the Rockets staged their infiltration, Houston center Clint Capela politely knocked on the Clippers’ locker room door and was promptly shut out, a failed Trojan Horse distraction. The Rockets briefly managed their way into the locker room, exchanging only words, before departing. Chris Paul concluded proceedings by referring to Lou Williams, who had 31 points on 12-19 shooting in a team-leading 39 minutes, as the Clippers’ “go-to guy…the guy they should play through,” a clear shot at Griffin. As veterans of the DeAndre Jordan/Banana Boat fiasco, Chris Paul and all the ex- and remaining Clippers should remember what it’s like to light NBA fans ablaze when they least expect. Perhaps, not for nothing, focusing on doing that in the playoffs would have behooved them all along, but regardless, they know how to cook some trending headlines and hashtags. The game itself was genuinely entertaining for most of its 48 minutes, solidifying a growing need for the NBA’s middle class amidst the sheer dominance of its one-and-only cream. Many Western Conference matchups appear appealing already – the Pelicans have at least a theoretical blueprint to beat the Warriors, although they certainly won’t, and a Thunder-Spurs matchup with a medically-fresh Kawhi Leonard could spawn years of headlines regarding selfishness vs. selflessness – but a Rockets-Clippers tie, just a summer after the latter lost perhaps its best player, along with several others, to the former, would be appointment viewing. One can only hope that a team featuring either Chris Paul or Blake Griffin would figure out how to win a playoff series. 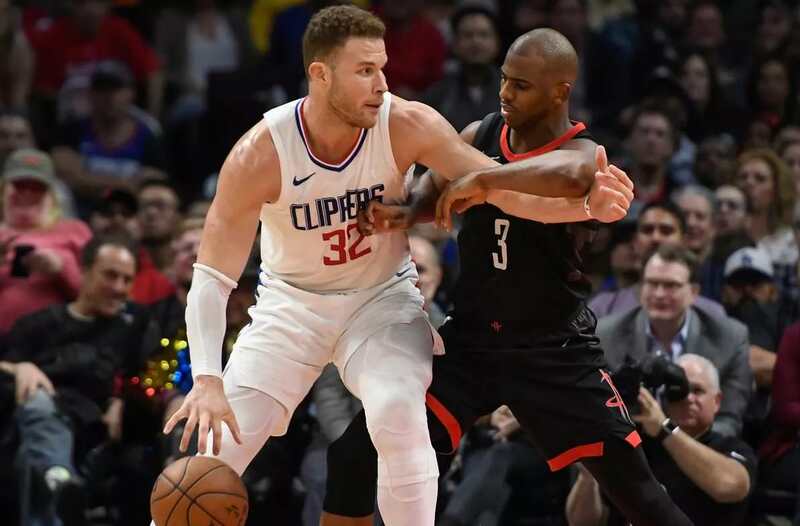 The dual presences of Blake Griffin and Chris Paul on each respective roster draw that into serious doubt, but I digress. In an era of questionable sourcing and “who do YOU believe?” journalism, I’m loathe to bring this up, but the tension between the two, as well as both of their relationships with Clippers center DeAndre Jordan, spilled onto the court at times when they shared a locker room. An aside: if you’re Gerald Green, and you’ve literally only been with the Houston Rockets since just after Christmas, why are you following these cats into this situation as you make a career out of being a journeyman? Two words, I suppose, suffice: guaranteed contract.